Its sugar and spice and everything nice at the Cannes this year because everyone is spreading sparkles on the red carpet whether it be their dress, makeup, jewelry or the complete look, all the actresses and models are nailing it off. 1) Let’s begin with the Bollywood beauty who is ruling the red carpet ever since she made her this year’s entry, we are talking about Aishwarya Rai Bacchan, this time she wore a designer Rami Kadi mint color gown with crystals embellished all over. 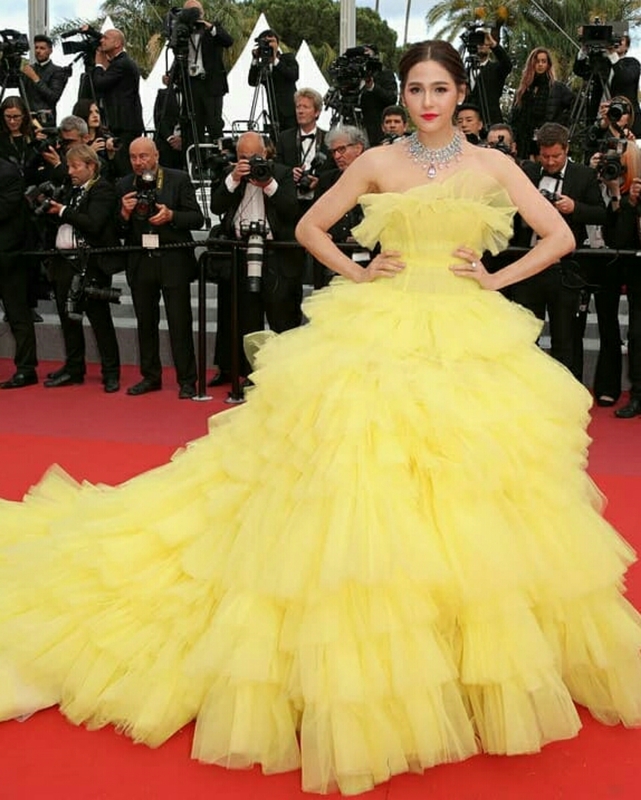 2) The next stunner on our list is the alluring Araya Alberta Hargate who glazed in the designer Giambattista Valli bare shoulder yellow color gown with ruffle detailing all over the dress. 3) It is said that pregnancy makes you more radiant and we agree because it was surely seen on the face of founder of Wandertea, the face of Loreal, Caroline Receveaur, she brought all the stars and moons,cosmic stars down on her gown by wearing a beige color strapless tulle dress by the designer Georges Hobeika and she looked completely astonishing. 4) Next on our list is Brazilian actress Bruna Marquezine & she adorned in the light pink strapless bustier tired gown in polka dots by the designer Lorenzo Serafini. 5) Who said that you can only wear gowns and dresses on red carpet? Just have a look at gorgeous animal lover Isabeli Fontana, she wore a black color sequined jumpsuit by the designer Lorenzo Serafini. So that’s all from us today, wait for the next time we bring to you the glittery details of Cannes Film Festival 2018 & until then…..Be Fashionable….!! !